Boy oh boy...are ya'll in for a treat today. And honestly, I'm sitting here trying to come up with a way to even start and drawing a blank. So much to tell you about my new Coin Purse Dies and Coin Purse Pocket Dies being released on March 15th at Papertrey Ink. Time just to jump in and hopefully this mammoth blog post will make sense in the end. So, I first did the Clever Barrette Covers and those were fun. And then we had the Coffee Cozy Dies and Coffee Cozy Details Dies, which got me thinking. What else could we do with this concept? At that point, I was absolutely hooked on this idea of using dies to cut pieces for felt projects. You see, I am NOT a handy with a sewing machine. At all. I hate the contraptions. Nothing frustrates me quicker than trying to use one. But I love sewing projects. You see my dilemma and my motivation, a bit. Mix them together and it is like lightenin' in a bottle inspiration-wise. In short, the solution of a stitching die and all the possibilities is really just a self indulgent way of fixing my sewing machine inadequacy complex. Fortunately, PTI is up for the ride:). And I'm hoping that you'll be on board as well. Because I have lots of ideas. Who knows what the future will bring. This month, I'm bringing you a way to make cute, clever, and highly personalized coin purses and pencil cases with a single die set. 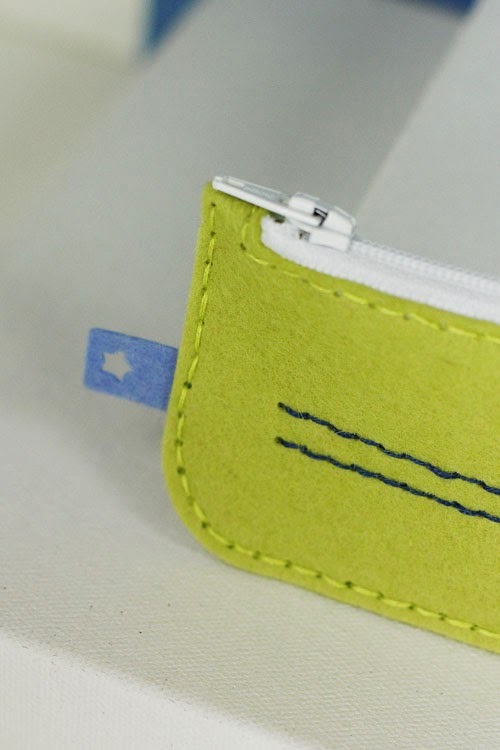 You've got the main rounded rectangle and two zipper dies (for inserting a 4 and 6 inch zipper.) to create both sizes. As some of the design team girls will show you, there's a third size (5x7) when you sew two of the large rectangles together instead of just folding one in half. Did I lose you a bit with the mention of the zipper? :) Looking for the nearest off ramp on this coin purse highway? I'm here to tell you that it is going to be OK. It is so much easier than you think. Not a problem at all. My very first time putting in a zipper was this past weekend and I did it perfectly. 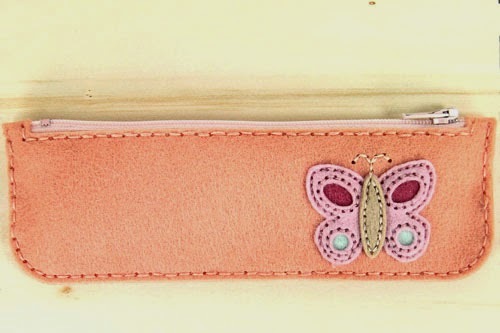 It's in that peach butterfly pencil case in the photo above. How's that for a testimonial? Proof's in the puddin'. Sourcing zippers is an easy task as well. Zippers in a wide array of colors are readily available and affordable on Etsy. We're talking 40 cents a piece, as opposed to $2.50 a piece at my local fabric store. I got 20 online in various colors, including shipping, for $12 and I had them in my hot little hands within 3 days of ordering. I highly recommend this seller here. LOTS of colors. I made a video for you to see what I mean when I say, "Do not fear the zipper." Click play to see me put together the blue coin purse above, zipper and all, as well as the Coin Purse Dies in action. I have a lot of projects to share, so let's get going with those. Our assignment for today's group post was to create a coin purse and paper project using the Coin Purse Dies. Here's mine. I cut the coin purse out of Classic Kraft felt. I also cut sections of the coin purse out of fabric treated with Heat N' Bond. (Here's a how-to video on that topic.) Before stitching put my coin purse, I ironed my fabric onto my felt. Then I was free to just stitch away. 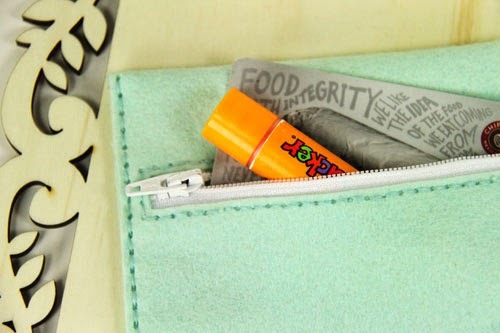 Almost forgot something else fun...the Coin Purse Pocket Dies. Man, these things have lots of applications. A gift card fits perfectly within the main pocket part. Imagine sewing a pocket into a card to house a gift card? Right there is a brilliant second way of using it. On this sweet pocket, I once again ironed Heat N' Bond onto fabric and then ironed that onto felt to create my pocket. The flap I cut just out of Harvest Gold Felt. The matching hole dies cut the holes for the pocket and the flap into the main part of the coin purse. 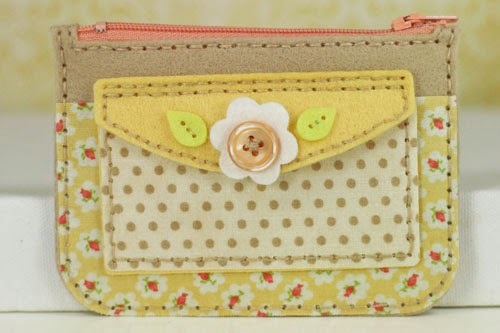 Line up the holes on the purse and the pocket and it is easy going with perfectly placed stitches. The pocket is fully functional. I used a sewn in snap to keep it closed. On the flap, I sewed in the flower (Floral Fusion 2 die and Melon Berry button) at the same time as the snap and with a single piece of thread. This way, it looks finished on both sides. The thread was tied off between the snap and the felt, making the knot hidden. The backside of my coin purse has a coordinating fabric section ironed in with Heat N' Bond. I took that as my inspiration for my card using Sweet Life, Embellished Elegance, Thanks All Ways, and Quick Stitch Sentiment Dies. Let's focus on the card alone for a second. This was cut with the Coin Purse Dies and folded at the mid-line. The edges have the open holes, which makes for a nice border and design element. 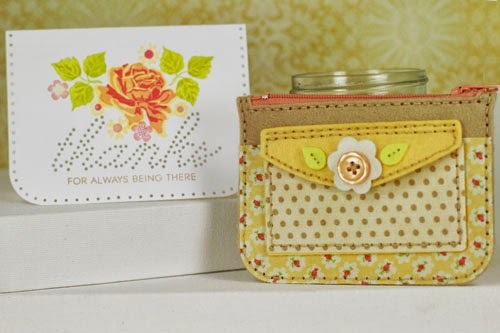 The card has the same dimensions as the Coin Purse I created, 3.5"x 5". I'll definitely be using it in this application in the future. Love this look. And isn't it great that you can use Quick Stitch Sentiment Dies to carry the theme even further? Next up, a pencil case for my 6 year old boy. The Coin Purse Die Collection comes with two size zipper dies. The smaller 4 inch die is used to put a zipper in a coin purse. The larger 6" die is used to put a zipper in the pencil case. (It holds shorter pencils and pens like Paper Mates perfectly.) Whether you make a coin purse or a pencil case is all up to how you fold your 5x7 inch piece of felt that you cut originally. Handy to have two sizes. I used my Stitching Lines Dies to cut stitch holes for the two lines on my pencil case and sewed them up with a navy thread for a decorative element. 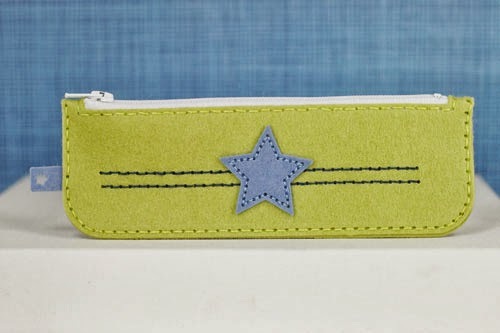 I also used the star from the Coffee Cozy Detail Dies Collection to add a Blueberry Sky felt star to the front. The Coffee Cozy Detail Dies come with coordinating tags to stitch in the seam of a coffee cozy. 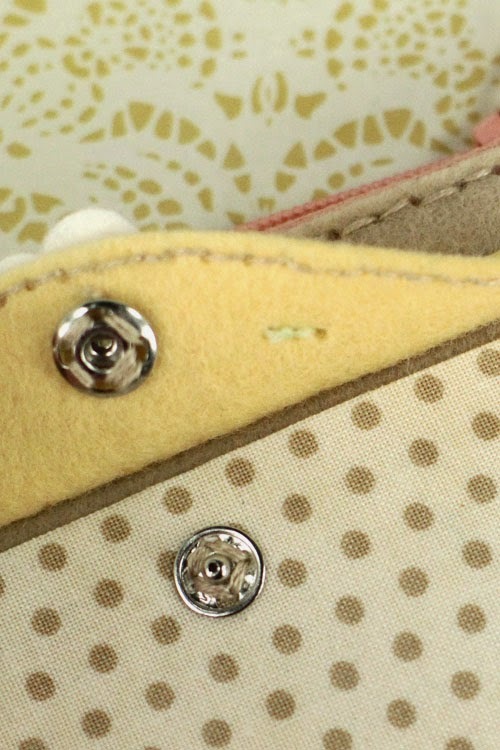 The holes are a bit closer together on the tag than they are on the Coin Purse Dies, but you can catch 2 out of the 3 and secure it in nicely as you stitch up your Coin Purse. Fun little detail if you so choose. I've been previewing all the new spring themed Seasonal Stitches Dies (Birds, Eggs, Shamrock, and Butterflies) this week during the countdown. They work well on the Coin Purse Dies and the Coffee Cozy Dies. And what's nice about felt is that your cuts are reversible. No scratch marks are going to transfer from your bottom cutting plate to the backside of your die cut. so you can flip them around if you like such as I did here to have the birds facing each other. You might also spot the swirl design on the birdie wings. That's an added detail in the Seasonal Stitches: Birds Collection that you can use to make your project more embellished. Or you can leave it out if you like as well. On this coin purse, I cut my coin purse out of Pure Poppy felt. I also cut it out of a grey chevron fabric with Heat N' Bond on the back and trimmed off the edges to give the look of red piping. Before I did that however, I sewed a pocket using the Coin Purse Pocket Dies into the inside of the coin purse. (A pocket can go inside or outside.) By ironing on the fabric, I covered my stitch holes in the felt and they don't show on the outside. I created a key ring by stitching a loop of Hibiscus Burst Grosgrain Ribbon into the side of my purse when I was stitching it up and attached a key ring to the loop. There are many a times that I would just like to have my ID, a credit card/cash, lip gloss, and my car and house key with me, instead of the big old purse. This fits that need nicely. Will just slip in my jacket pocket or the zippered compartment of my camera bag. 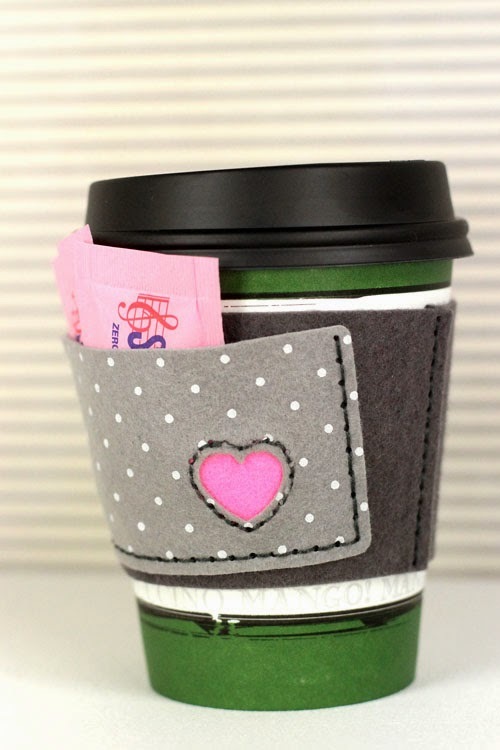 And lastly, how about some Coffee Cozy Die inspiration while we revisit the Coin Purse Pocket Dies? The pocket fits on the larger half of the coffee cozy. Now, the coffee cozy has a slight curve to it and the pocket does not, but it really doesn't make a difference to the overall design, especially when you have it on a coffee cup/mug. I thought that having a pocketed coffee cozy would be handy. You could use it to hold a tea bag and some sweetner packets like I did here. 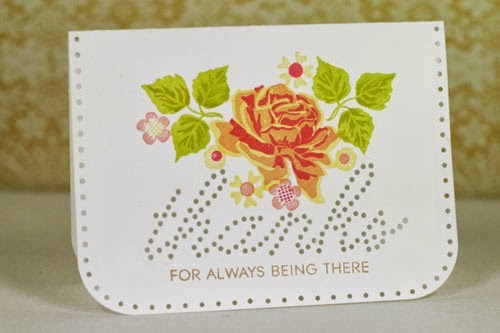 Or, you could drop somebody off a latte at their desk at work with a birthday note tucked inside. Or maybe hand your husband one on his way out the door with a little love note to read on his way to work. See...possibilities. I used Smokey Shadow felt on my project as my coffee cozy base. the grey polka dot felt was something I got off Etsy. I also used the heart patch detail from the Seasonal Stitches: Eggs coming out this month as well. OK. That's it with my Nichole worthy blog post today. If we are going by length that is...I can hardly measure up with content! HA! I know everybody else's projects are spectacular. We've been sharing them back and forth for the last few days. We've all been a bit excited. I hope you are in the same boat. I've got a bit of a full day today with shuttling kids around, running errands, and prepping for my sister's baby shower tomorrow. I want to answer you questions on the message board if I get a chance, but if I don't respond right away, please know I'm not ignoring you. Just super busy today. I'll pop in there when I get a chance and answer whatever questions I can. Interested in adding any of these new products to your crafting arsenal? You don't have to wait much longer. They'll be available to purchase at 10 PM EST on March 15th at www.papertreyink.com. You are incredible!!!!! This is such a wonderful design with so many options! I love making little sewing project kits for my niece and she would love making these! The zipper looks easy enough for her, she is 11 years old, and I think she would love the purses she could create!! Oh Erin these are fabulous!! Love love love this can't wait too get them. One question do you know if you should use the 2 white shims with the big shot thanks!! Wow, Erin, these dies rock. 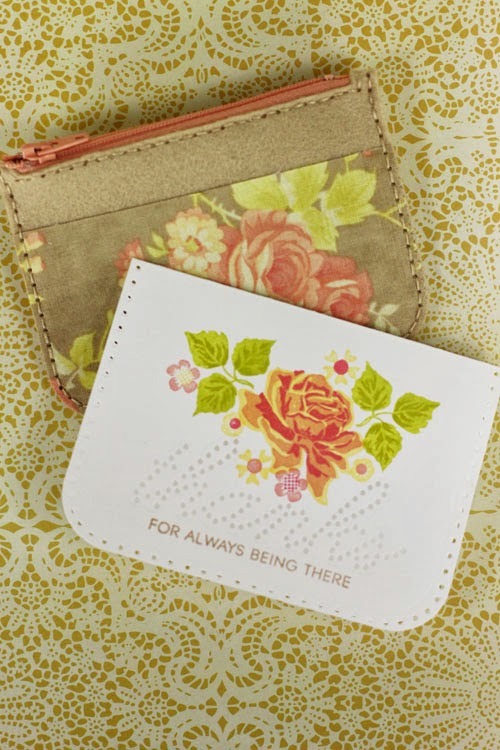 Your card and projects are so cute. I'm not sure I am up for doing the zipper but I am ordering these dies to make tags and cards for sure. Erin, for a non-sewer you sure do come up with some of the cutest sewing projects!! 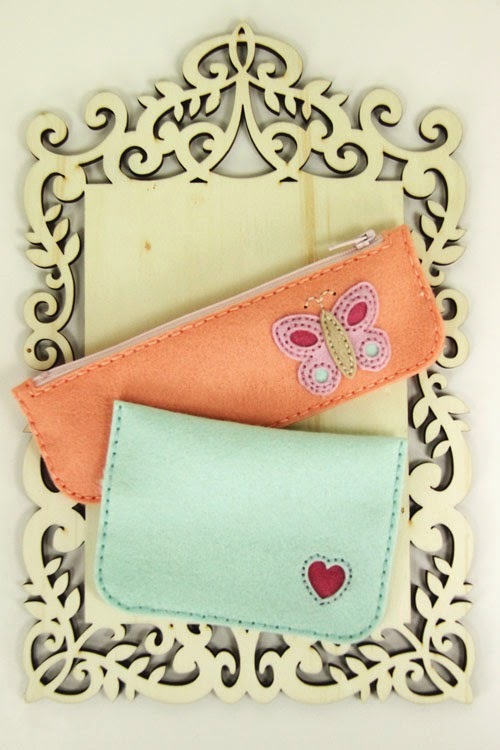 These coin purses are absolutely adorable and I cannot wait to make a few for my granddaughters! I think they will just love them. Congrats Erin this is an awesome and unique die. Seriously cool. I admit when I first saw the post on Nichole's blog, I wasn't that interested. I thought, well that's neat, but I'd probably never use it. I can sew after all. Then I saw Nichole's projects and started checking out the design team projects. Yep. Sucked right in. There are so many great possibilities with these dies! More versatile than I thought at first. I am super impressed by how well these are designed! I love the new seasonal stitching dies too, especially those darling birds and butterflies. Bravo, Erin! Erin you are brilliant! I want to start making one now! But I guess I'll have to wait like everyone else ;) Love them all but the kraft felt set is just gorgeous! very clever way to sew! cute projects and design elements! Fabulous - wow! Thanks for making it so practical to assemble! These are seriously so awesome!!! You've definitely hit the ball out of the park on this release ~ so incredibly clever!! Pure genius! I also hate sewing machines and really appreciate what you have come up with here. The fact that you anticipated the "zipper fear" factor is hilarious! Oh, you are so creative! Such great little purses.. So many possibilities. Love your running stitch, make it so neat and the same on boyhood sides. Way to go, Erin!!! These new coin purse dies look absolutely FANTASTIC!!! Love this clever idea! And thanks for the video too! I do not know how to sew at all, but your video makes it look so easy!!! Would love to try this out!!! Erin, thank you for creating these fantastic, amazing, fabulous dies! I love your video, and the gorgeous projects you've created. I am so excited and happy that I can't hardly wait to order the dies tomorrow! great vid EL. very creative dies. I so love your coin pouches and that little pencil case. DARLING!!!! Oh Erin, you are just genius! I too have a mortal fear of my sewing machine (zippers terrify me!). I love your unique approach to tackling your fear. Putting in the thought and effort to create a full line of stitch-able (is that a word?) dies kinda squashes any previous rights of mine to moan about zipper terror lol. Erin, you are beyond creative...I absolutely love your designs!!! Cute, cute, cute! I love these!! Erin! You are seriously clever. I love this project and I can't wait to get my hands on these dies. Thanks for sharing your video. I think I can even do zippers! Yikes you've been busy! Your projects are beyond cute, so versatile and great quick gift ideas. You truly have outdone yourself this month - AGAIN! Fab-u-lous! These are wonderful and I was picturing myself making them with my nieces. Oh Oh my Erin!!! I was beside my self at work yesterday and today after seeing the video I am even more excited for this die!! The ideas are endless!! So excited to add these dies to my collection!! Great video and awesome die!! 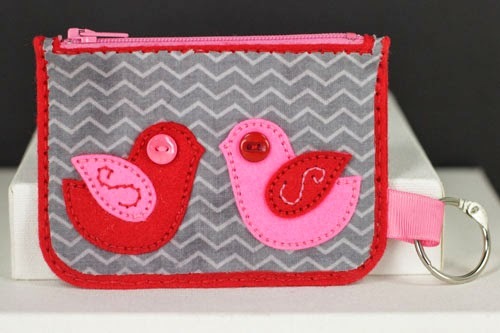 I love this little coin purse and I want to sew up a ton of these cuties! Also, I wish you could edit your comments. "My second favorite thing in here is your blog name". Yeesh. English, good it is. This die you created got me to buy from PTI for the first time! I love it. I also love sewn projects and hate sewing machines. I will be using the die to do sachets with lavendar as well. And lots of purses for my nieces. Thank you! !